At Spa Valet, we’ve developed a sophisticated mobile spa cart so that business owners can take their spa business on-the-go. When you have access to a Spa Valet Spa Cart, your clients receive sophisticated treatments from the comfort of their own preferred space. Whether it’s in their home, a hotel room, or at your brick and mortar spa location is up to you, the business owner. We are the world’s first and only patented mobile spa cart, giving those with the desire to supplement their overall experience with a spa trolley offering complete with a robust set of features. 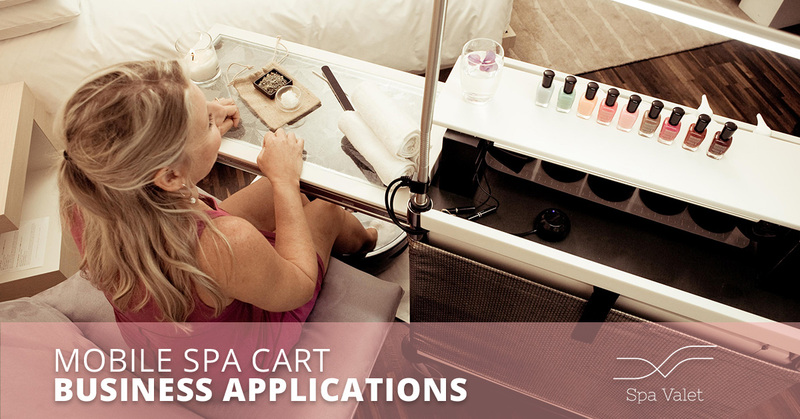 Read below to find the suite of spa services a spa cart provides, with additional information regarding spa cart business applications for spa owners, hoteliers, hospitals, technicians, and others. We provide everything that therapists and estheticians require at their fingertips. With an intuitive design, there is little to no prep time, even for in-room spa treatments. This can make a tangible impact for clients who prioritize comfort and ease when making their decision as to where they will be spending their money. If you are interested in learning more about the spa trolley’s specifications, we encourage you to do so. Perhaps you are a spa owner looking to expand your means of revenue generation with a unique service to set yourselves apart from the immediate competition. Maybe you are in the hospitality industry and, as a hotelier, you would do everything in your power to provide a luxurious experience to your guests, especially if it makes a substantial impact to the bottom line. Being able to offer in-room spa treatments within your hotel is worth your consideration. Below we highlight the virtues of adding Spa Valet to each of the aforementioned industries. If you’ve been searching for a way to extend your spa brand outside of your physical spa space, consider adding a mobile cosmetology trolley to your spa services. Of course, being able to come to your customer is a virtue in its own right, but being able to help fill your technician’s book of business with a unique perk like mobile spa service is the other side of this coin. Expanding your spa’s culture outside of your brick and mortar spa has the added impact of expanding your networking capital in the community in which you operate. Once word gets out, you can take your spa treatments anywhere — imagine corporate spa parties, country club poolside spa parties, VIP spa house calls, or visiting a retirement community for a day or two! Generating a brand-new revenue stream without needing to add to your staff is a rare opportunity. In our experience, it’s a realistic expectation to be able to pay off the cost of one Spa Valet Cart in as little as five months using the revenue generated from mobile spa cart treatments themselves. Because mobile spa services typically are billed between 20 and 40 percent more than in-spa services, it’s not unreasonable to be making in the range of $175 per hour, before tips. Heather Mikesell, Executive Editor of American Spa Magazine said this about our carts and systems – “I have come around to the idea of in-room spa treatments, thanks to this cart. It cuts out the awkward prep time, by putting everything therapists and estheticians need right at their fingertips.” When you are able to provide tailored spa treatments to folks from the comfort of their own preferred location, it’s a chance to do something special. The common thread is that Spa Valet mobile spa carts are an exciting way to develop a new revenue stream while offering a specialized service. For decision-makers in the hospitality industry, perhaps at a luxury hotel, Spa Valet is a means of offering a five-star amenity to your guests without the exorbitant expense of building out a spa space. Not only is this expense typically unrealistic, but guests will see an in-room spa treatment as VIP treatment they likely haven’t experienced before. Developed in four and five-star hotels on 5th Avenue, Wall Street, and Grand Central Station, we’ve found it’s realistic for hotels to be able to pay off the expense of one Spa Valet Cart in as little as five months, with only 7 spa services per week! Obviously, we anticipate the in-room spa service to gain significant traction more than over such a period. A 300-room hotel can make an additional $62,000 in annual revenue from a single spa trolley! Keep in mind that our spa carts can be customized to fit in with any hotel decor, from glass, fabrics, and powder coats to brand names and logos. Transform any space you may have available into a multi-sensory spa experience. As an alternative to building out a dedicated spa space, hospitals utilize our mobile spa trolley to offer spa services in maternity suites, infusion centers, women’s centers, or other locations. You only need a space the size of a broom closet in which to store your spa trolley so that you can offer a dedicated spa service which provides massage, manis/pedis, mud wraps, facial steamers, and more. If your locations have rooftop locations or unused verandas, these make ideal “spa glamping” spaces! It’s possible that you don’t own the spa at which you are employed, but that doesn’t mean it’s impossible for you to make up to 160 percent more on a typical facial by combining it with an aloe foot and hand-wrap. Our clients have experienced an average income increase of 25 percent when including mobile spa cart services to their current workflow. The esthetician cart fits in through any standard-sized door and setup takes less than seven minutes. Visualize private, poolside spa services — or capturing the attention of a new generation of spa-enthusiasts, like millennials! Even if you are a non-technician business owner, there are plenty of high-end hospitality venues without spa spaces than there are with. It’s no secret that a key to commercial success is distinguishing yourself from the competition, and being able to increase the reach of your business by catering to your guests in the comfort of their homes certainly qualifies as exactly that. With little overhead costs, you can significantly increase your monthly revenue, irrespective of your specific industry. Receive your custom quote from Spa Valet today!